It will take some time for undefeated Filipino breakout star Jomary “The Zamboanganian Fighter” Torres to get used to the spotlight after getting her hand raised on two-straight occasions on the global stage of ONE Championship. While Torres never asked for it, she has become a celebrated figure following back-to-back wins inside the ONE Championship cage in 2017. Torres shocked the world in August 2017 when the little-known atomweight from the Philippines made her promotional debut against Thai martial arts heroine Rika “Tinydoll” Ishige at ONE: KINGS & CONQUERORS in Macao, China. While the Thai standout has emerged as one of the most popular talents in Asia’s martial arts scene, Torres stole her thunder on that fateful night when she submitted Ishige in the second round of their exhilarating contest. Torres stepped on Macanese soil with little fanfare, but by the time the Filipina warrior left the glamorous Cotai Arena, everyone knew who she was. Three months after she forced Ishige to wave the white flag in her maiden ONE Championship appearance, Tores out-grappled Indonesia’s Nita Dea en route to a unanimous decision victory at ONE: HERO’S DREAM in Yangon, Myanmar. Despite the fiery performances in her first two outings under the ONE Championship banner, the 21-year old Filipina is actually a shy, soft-spoken girl with sincere eyes. However, unknown to many, her mild-mannered demeanor hides the adversity she dealt within her childhood. Torres and her older brother were actually left under the care of their grandmother since they were infants. Deprived of both parents, Torres still grew up to be a well-mannered lady as her grandmother filled the void left by their absence. Despite not having a stable business as a source of income, her grandmother found ways to provide, such as picking up extra work at a school cafeteria. As a result of her circumstances, Torres was regularly picked on by some of her classmates at school, which left her with no other choice but to fight back. Although she suffered bullying, the abandonment from her parents, and the lack of any real role models, Torres had a simple dream of becoming a basketball player when she was a young girl. Having played in fiestas and for her school, Torres thought that she could eventually find a way to make a career out of her hobby, but circumstances would not allow her to pursue that road. “Instead of letting my grandmother work even more just to get me through college, I decided to stop going to school and find a job to help her out,” she said. Out of desperation, Torres did not did not hesitate to take a job in Taguig, Metro Manila, where she worked as a nanny. During her time as a nanny, Torres met Ruel Catalan, who frequently trained at a gym near the school where the child that she took care of was studying. While waiting for the child to finish school, Torres swung by the gym to watch the action firsthand. For three years, the usually-active Torres was contained in a job where she could not feed her competitive spirit and could only envy them from the sidelines. Watching people get fit, all while satisfying that craving for competition through martial arts enticed her. In 2015, Ruel introduced Torres to his older brother, Rene Catalan, multiple-time Wushu world champion and head coach of Catalan Fighting System. After receiving an offer to join the team, Torres did not think twice to leave her job as a nanny and trained to become a full-time martial artist. With no martial arts background, it came as a shock for her when she was immediately booked for a match. As homage to her hometown, Torres took the nickname of “The Zamboanginian Fighter” as her alias when she had her professional debut in August 2016 at a local show. Torres pulled off the unanimous decision victory, and from then on, the Catalans knew that they had a potential star on their hands. In merely three years, Torres has emerged as a promising talent and has compiled an undefeated professional record of 3-0. Torres credits all of her success to her mentor Rene Catalan, who equipped her with the necessary tools to flourish inside the cage. On Friday, 26 January, Torres will once again be strutting her wares under the bright lights as she takes on fellow Filipina April Osenio in a three-round atomweight clash on the undercard of ONE: GLOBAL SUPERHEROES in Manila, Philippines. If there is anyone who knows about the pressure of following up back-to-back victories, it would be Osenio as the Team Lakay athlete rebounded from a 2015 loss with back-to-back wins against the likes of Natalie Gonzales Hills and Malaysian star Ann Osman in 2016. However, Osenio could not capitalize on her momentum as she stumbled with a string of defeats to former atomweight world title contender Jenny Huang and most recently to current ONE Women’s Strawweight World Champion “The Panda” Xiong Jing Nan. Even with the recent setbacks, Osenio is a two-time Philippines’ national Wushu champion, who has competed against world-class talents at the top of both the women’s atomweight and strawweight divisions. Torres acknowledges the capabilities of her compatriot, sharing that she is training diligently in every aspect of the game. “I am still not certain how I will go about with the match. She will have to wait and be surprised with what I am going to do in the cage,” she teased. 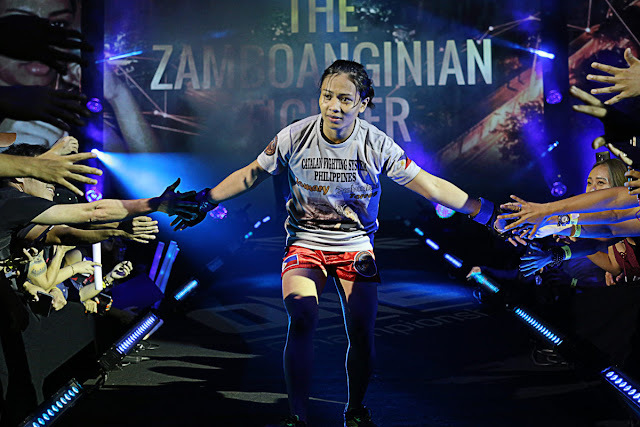 Torres is singularly focused on the task at hand, but she is not short on motivation as “The Zamboanganian Fighter” is driven by making life better for her loved ones and the people who have continuously supported her along the way. “I want to give back to my gym, and the people who love and support me. I am competing for my country. Everything I do is for all of them, and as long as I can do this, I will keep doing this,” she ended.